Another good news for all Filipino workers, specially to those who has advanced age and struggling to find a job. The Department of Labor and Employment (DOLE) announces that the age discrimination in the hiring of workers will be banned. According to the explanation of the Labor Undersecretary Joel Maglunsod, "The intent of the law is positive because it promotes hiring of those who are still productive despite their age. The DOLE supports this law because it allows people to have a source of income and provide for their and their families’ needs." Citing the Republic Act 10911, which penalizes employers who refuse to hire workers because of their advanced age, is a positive development for the labor sector. The law was approved by the Congress but it lapsed because it was not signed by former president Benigno Aquino III. According to Philstar, the Republic Act 10911, may becomes active and effective on August 16, 2016. 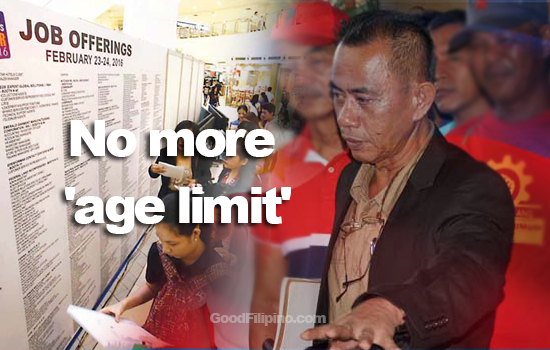 The DOLE would be obliged to require employers to abide by the new regulation, Maglunsod said. Under the said new law, it shall be unlawful for an employer to require declaration of age in application process or decline any employment application because of age. Under RA 10911, it is also unlawful for employers to lay off workers because of old age or to set an age limit in employment. If the company found guilty, they may face fines of P50,000 to P500,000 and imprisonment of 3-months to 2-years. What do you think about the new law for all Filipino workers? Please share your thoughts below. Comments or suggestions about "DOLE: No more 'age limit' in employment" is important to us, you may share it by using the comment box below.